Last Friday, the T-4 capacity auction for 2021/22 closed at a record low price of £8.40 /kW/year, far below the pre-auction forecast of £17-25 /kW/year, with the Net Welfare Algorithm once again setting prices. 74 GW of de-rated capacity bid with just over 50.4 GW of contracts being awarded. Existing generation secured over 85% of these contracts, with new and existing interconnectors together taking 9%. Unproven DSR won 2.5% of the awarded capacity, with new and pre-refurbishment generation taking just over 2.5% between them. Of the unsuccessful plant, 59% of the capacity leaving the auction early was new-build generation and 36% was existing generation. 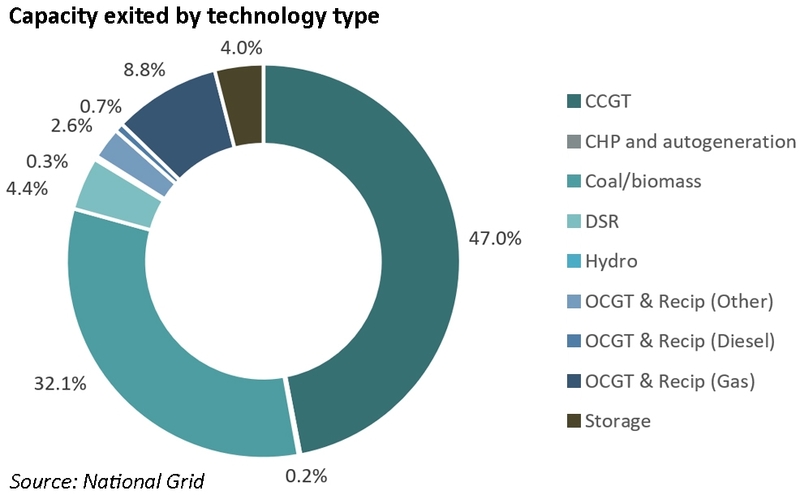 CCGTs represented almost half of the unsuccessful plant, and coal almost a third. Clearly, in order for new generation to be economic, higher prices would be needed, and it now looks likely that if the Government wants to see new large power stations being build, the rules of the scheme will need to change. This auction followed all previous auctions in favouring existing capacity and failing to deliver the price signals needed to bring new plant into the market. While a significantly lower clearing price may be positive for consumers, much of the plant securing contracts is likely to retire in the coming decade, with coal being marked for closure by October 2025. In fact, coal may well be uneconomic before that date, meaning that the Government needs to start making adjustments sooner rather than later if it is to secure the new large plant it says it needs to secure the system. 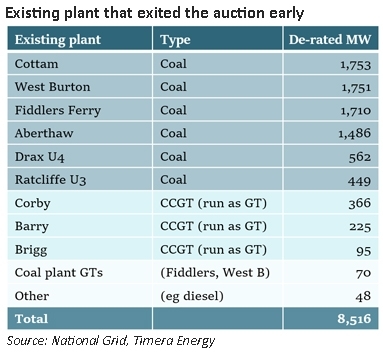 Of course, there are a number of commentators who argue that the auction results illustrate that the market does not require any new large thermal plant to bridge the gap to a de-carbonised future. Some also point to the success of interconnectors in the auction, highlighting that increased interconnection will allow the country to secure its supplies by relying on imports. The resulting picture is rather confused. Despite an increasing amount of renewable generation on the system, National Grid has determined that over 50 GW of de-rated capacity is required to ensure security of supply, and most of this is existing thermal and nuclear plant. This fleet is beginning to age, and older plant will typically be less efficient. 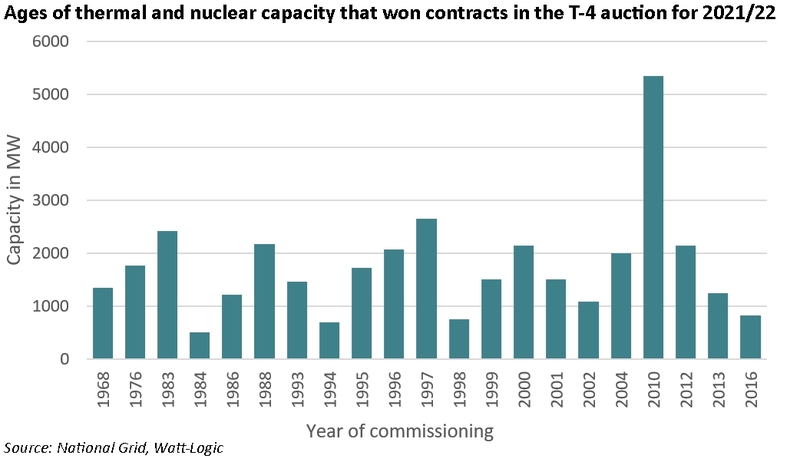 As existing plant can only secure 1-year contracts, in failing to attract significant new capacity, the auctions are at best only securing capacity over the medium term. This assumes that the economics remain viable for the operators, and they don’t decide that paying the non-delivery penalties is more attractive than bearing the costs of remaining open over the next four years – lower auction prices lead to lower penalties, so at these levels, the dis-incentive to early closure is reduced. It also assumes that the de-rating process is not overstating the likely availability of the participating units – this could be a particular problem for interconnectors, where previous analysis has shown that GB tends to export electricity during periods of high domestic demand, particularly to France, since weather correlation and higher temperature sensitivity in France means that at those times, French demand rises faster than GB demand. If the interconnectors are available but exporting due to higher prices in the connected markets, the effect will be negative for security of supply, by an amount double the available transmission capacity. Ultimately, this is a question of whole system design – or the lack of a coherent whole system design. The decision to de-carbonise the electricity market through the introduction of intermittent generation has fundamentally changed the nature of the market…on a physical level where falling inertia requires a new approach to voltage management, and economically where no aspect of the system is able to operate without some form of subsidy or external support. All of this is being paid for by consumers through ever increasing bills, and it is far from clear whether de-carbonisation goals can be met and whether it would make any difference if they were. A suitable epitaph for the National Grid. When I looked at the auction supply curve it was plain that cost starts escalating sharply above the selected 50GW demand level: much hinges on the validity of that choice. It would prove totally inadequate if there is any move towards electrification of transport and domestic heating, for example. It could also prove inadequate if derating factors prove in practice to be optimistic. It is surely a high risk to think that we can regard interconnectors as reliable sources of supply, rather than as risks of being sucked into Europe wide shortage pricing. There is added political risk arising from Brexit too. Eirgrid ( the TSO in Ireland ) de-rate all subsea interconnectors by 50% for this reason. What figure is applied to U.K. – Europe IC’s ? The question is whether these are the right numbers. Everything can look great until there is system tightness, and if you suddenly find your interconnectors are exporting rather than importing there can be trouble (as happens on IFA where the higher weather sensitivity in France can mean the same drivers of demand increase French demand more and switch IFA to export mode just at the time the power is needed in GB).